Our political Quote of the Day comes from former Florida Republican Jeb Bush, brother of you-know-who, who told the New York Times that a big Republican victory will not be a validation of the Republican Party but a vote against a “massive overreach” by the Democrats and disgust with politicians and their inability to get results that proved politically disastrous. But former Governor Bush said Republicans must make clear that their top priority is increasing employment and economic growth. In particular, he advised Republicans to seek common ground with Mr. Obama and Democrats on trade and energy policy. However, this may be hard to do with some members of the Tea Party movement, echoed by some key GOP politicos, vowing that there will be no compromise with the Obama administration at all. What’s clear, after Republican defeats in 2006 and 2008 and Democrats’ travails this year, is that both parties remain at risk so long as Americans suffer from high unemployment and weak economic growth. As the political world begins looking ahead to the 2012 elections, that means the widest opening for an independent candidacy since Ross Perot’s 1992 campaign. 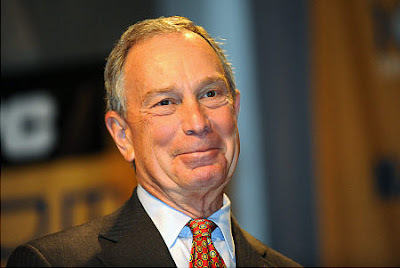 Do I sense Michael Bloomberg smiling?